Get your Champion San Francisco Federation Gear! The 2013 season proved to be an amazing one for all, but none more so than the FSL Champion San Francisco Federation. Now that they’ve been crowned champs, get geared up and show your pride. 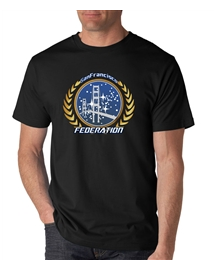 Federation T-shirts are available in White, Black or Ash in Adult, Ladies, Youth and even Toddler sizes. Head on over to Slashloot and grab a couple! Once your in uniform, it’s time to bring the team home! With Fatheads! The new Federation Team Fathead Wall Graphic will let you show off your team pride in style. Get one for home and another for away missions.